Advanced Limousine Service Flint, Mid-Michigan, Detroit. 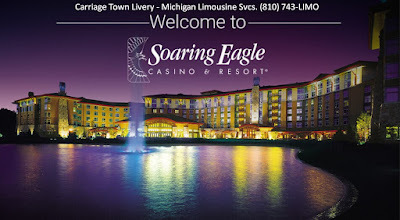 Limousine service for Soaring Eagle Casino, Hotel, and Entertainment resort in Mount Pleasant, Michigan that is owned and operated by the Saginaw Chippewa Tribal Nation. Arrange Soaring Eagle transportation DIAL 810-743-LIMO! Limo Service Lapeer, MI 48446. Airport Transportation Limo Hire Flint, MI. Carriage Town Livery #810743LIMO. Picture Window theme. Powered by Blogger.